Chemical resistant labels that can be embedded in the resin capsule or mold, alongside the sample, designed with small perforations down the middle that allow the label to be folded in half, creating an adhesive-free double-sided tag. This tag can be printed with alphanumeric text, serialized numbering, as well as 2D barcodes and works with any standard model of thermal-transfer printer. The small size of the ResiTAG label accommodates various size embedding capsules and molds routinely used in electron microscopy research facilities. 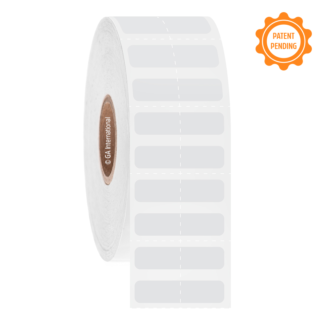 When printed with a chemical-resistant resin ribbon (XAR-class, GA International), the label and printout withstand histological resins and oven incubation up to 100°C. In addition, the printout can also withstand 70% or 100% ethanol, methanol, isopropanol and other alcohols, xylene, toluene, acetone, formalin, dimethyl sulfoxide (DMSO), methyl ethyl ketone (MEK), as well as other harsh chemicals, solvents and histological stains.